While the mainstay markers of idyllic destination weddings entails cruises, white sands and tropical beaches, a dream wedding is not always about going to exotic tropical locations, nor experiencing the rush of adventure and excitement. To some, a dream wedding can be found in being backdropped by the things that a couple loves and is passionate about, as Ontario’s best summer outdoor concert series – the Peterborough Musicfest – has come to prove about lovers of music. With the passion for music being the primary driving force behind the Peterborough Musicfest, the event has seen slews of music lovers taking part in its celebration, a status that truly lives up to the ideals of its inception and organization as an occasion. Featuring a diverse range of talents and scores of musical genres, the Peterborough Musicfest takes its status as Ontario’s best summer outdoor concert series seriously, witnessing an increase of followers as the festival is staged year in and year out. But as the festival has seen a growing number of followers, it has also become a crucial point for to-be wed couples, particularly those who are keen on good music. 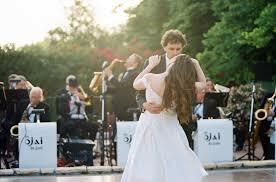 Though not exactly set on getting married in the middle of a performance, music lovers from different walks of life are known to have set their dream destination wedding in Peterborough, particularly during the run of the Peterborough Musicfest. The trend certainly does away with the more conventional ideals of destination weddings, but it easily reinforces what weddings should focus on – on the bride and groom celebrating their union, in their own terms and in their own unique way.